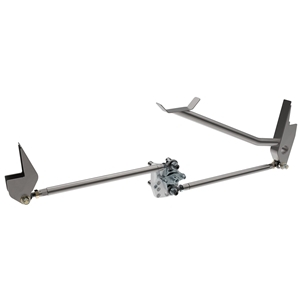 Universal-Fit Billet Watts Link - Provides perfectly centered suspension travel and accommodates inside frame rail spans up to 50”. Links are 4130 tubular steel for welded assembly with threaded billet adapters. Laser-cut frame brackets and pre-bent gussets must be custom-fit for installation and final welding. Components are shipped unassembled. Note: Recommended for use with Universal-Fit g-Link Torque Arm.